I have no idea where the week went! I did not get everything I wanted to planned out, but did manage to complete five more flowers. I am planning on laying out what I have completed so far and figuring out how big I want to make my quilt. I hope to have a design for next week so I know how many more I need to complete. :) Thanks for stopping by and feeling thankful for the encouragement from everyone participating in MMSC. I am linking up with Jessica at Life Under Quilts and if you stop by and check out everyone's progress you won't be disappointed! Very pretty flowers, I like your color choices. Nice combinations. I'll watch for your post next week. Oh, I love aqua and coral together. This is going to be fabulous! Good job! Thank you for all your wonderful comments! 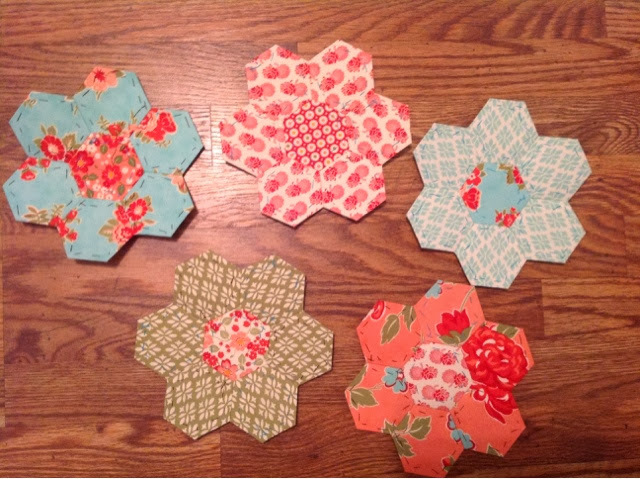 It is what keeps me motivated to complete even more than expected :) I fell in love with the colors....they reminded me of my grandmother's quilts and I just had to do something with the fabric...and then along came EPP!